The composers Kurt Weill and Hanns Eisler and the poet Bert Brecht all experienced the fascinations and abysses of foreign lands and exile. What good fortune it must have been in Berlin in the 1920s when Weill and Brecht had such great success with their songs always telling of far-away countries and unknown things. At the time, they created an unmistakable style that has remained unique up to today with its mixture of popular music, supreme musical sophistication and political claims. 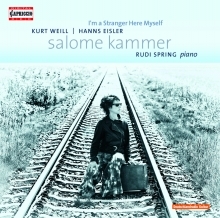 Salome Kammer’s repertoire cannot be classified into subjects and genres. It covers avant-garde song and virtuoso vocal experiments, classical melodrama, song recitals, Dada poetry, vocal jazz or Broadway songs. 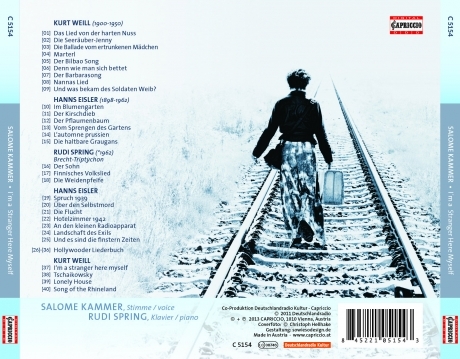 Salome Kammer has held the international premieres of many works of New Music.